The present invention relates to a novel hydrocarbon resin and the modified product thereof. More specifically, it relates to a novel hydrocarbon resin and the modified product thereof having a high softening point and a low melt viscosity, and suitable for use in adhesives and traffic paints. As is well-knoen in the fields of, for example, pressure-sensitive adhesives, hot melt-type adhesives, coating compositions, and traffic paints, various resins such as rosin type resins, alkyd resins, and epoxy resins can be used as tackifiers and adhesive raw materials. Of these resins rosin type resins have most desirably been used. However, rosin type resins cannot match the recent remarkably increasing demands because the raw materials thereof depend upon natural resources. Accordingly, various petroleum hydrocarbon resins have recently been developed to substitute for rosin type resins. For instance, hydrocarbon resins derived from the polymerization of a C5 fraction including 1,3-pentadiene, isoprene, and 2-methyl-2-butene in the presence of a Friedel Crafts catalyst have been used in adhesives, coating compositions, and traffic paints. Recently, low melt viscosity type tackifiers have been desired in hot-melt type adhesives (because an increase in working speed is required while maintaining uniform application) and in traffic paints (because an improvement in both the working speed and the drying rate is required due to the recent increasing traffic volume). However, hydrocarbon resins having both a low melt visosity and a high heat resistance (high softening point) have not yet been developed. For instance, attempts to decrease the melt viscosity of the above-mentioned hydrocarbon resins derived from a C5 fraction, have tended to reduce the softening point whereby the heat resistance or stability becomes poor, and attempts to increase the heat resistance or stability inevitably result in a high melt viscosity. In accordance with the present invention, a hydrocarbon resin is provided consisting essentially of a copolymer of (A) at least one unsaturated hydrocarbon selected from the group consisting of (i) unsaturated chain hydrocarbons (i.e., linear or branched unsaturated hydrocarbons) and (ii) cyclic hydrocarbons having at least one vinlyidene group and (B) at least one compound selected from the group consisting of 9,10-dihydrodicyclopentadiene and its derivatives, the amount of the polymerization unit of component (A) in the coplymer being 20 mol% to 98 mol% and that of component (B) in the copolymer being 80 mol% to 2 mol%. Hydrocarbon resins according to the invention suitably have a softening point of 60°C to 180°C, a melt viscosity of 5 mPA-s (cps) to 10000 mPa·s (cps), and a number-average molecular weight of 300 to 15000. They may have high compression strength and good weatherability. The above-mentioned copolymer desirably contains 30 mol% to 96 mol% of the polymerization unit(s) of component (A) and 70 mol% to 4 mol% of that of component (B). Resins in accordance with the present invention can be modified by addition reaction with ethylenically unsaturated carboxylic acid or derivative (e.g. anhydride) thereof or hydrogen; such modified resins may be suitable for use as a tackifier. wherein R19 to R23 are independently hydrogen or a methyl group, R23 is hydrogen or an alkyl group having 1 to 6 carbon atoms and m is 0 or an integer of 1 to 3, R23 may be the same or different in the case of m = z or 3, R24 is a saturated or unsaturated hydrocarbon chain having 1 to 6 carbon atoms, I is 0 or 1, X is a saturated or unsaturated hydrocarbon chain having 2 to 6 carbon atoms, Y is a saturated or unsaturated hydrocrbon chain having 3 to 7 carbon atoms, and the hydrocarbon chains represented by X and Y may be substituted with an alkyl group having 1 to 4 atoms or a halogen atom. Typical examples of monoolefins having the above-mentioned formula [I] are ethylene, propylene, 1-butene, 2-butene, isobutylene, 1-pentene, 2-pentene, 1-hexene, 2-hexene, 3-methyl-1-pentene, 4-methyl-1-pentene, 1-heptene, and 2-octene. Typical examples of cyclic hydrocarbons having a vinylidene group (CH2=C<) and having the above-mentioned general formula [IV], [V] or [VI] are 1,2-dimethylidene cyclohexane, 1,2-dimethylidene cyclopentane, vinylcyclohexane, limonene, styrene, vinyltoluene, a-methylstyrene, isopropenyltoluene, tert-butylstyrene, allylbenzene, and p-tert-butyl-allylbenzene. Of the above-mentioned hydrocarbons, chain diolefins having 4 to 6 carbon atoms, such as 1,3-butadiene, isoprene, 1,3-pentadiene, and 2,3-dimethylbutadiene, aromatic alkenyl compounds having 8 to 10 carbon atoms, such as styrene, a-methylstyrene, and vinyltoluene, and 1,2-dimethylidene compounds having 8 to 10 carbon atoms, such as 1,2-dimethylidene cyclohexane, and 4,5-dimethyl-1,2-dimethylidene cyclohexane, and mixtures thereof are desirable from the viewpoint of the resultant resin properties. Most desirable hydrocarbons are 1,3-pentadiene and/or a mixture thereof with one or more other hydrocarbons containing about 30% by weight of 1,3-pentadiene. The above-mentioned hydrocarbons can be used, as component (A) of the present invention, alone or in any mixtures thereof, for example, mixtures of homologous compounds, mixtures of monoolefins and diolefins, mixtures of monoolefins and cyclic hydrocarbons having a vinylidene group, mixtures of diolefins and cyclic hydrocarbons having a vinylidene group, and mixtures of monoolefins, diolefins and cyclic hydrocarbons having a vinylidene group. 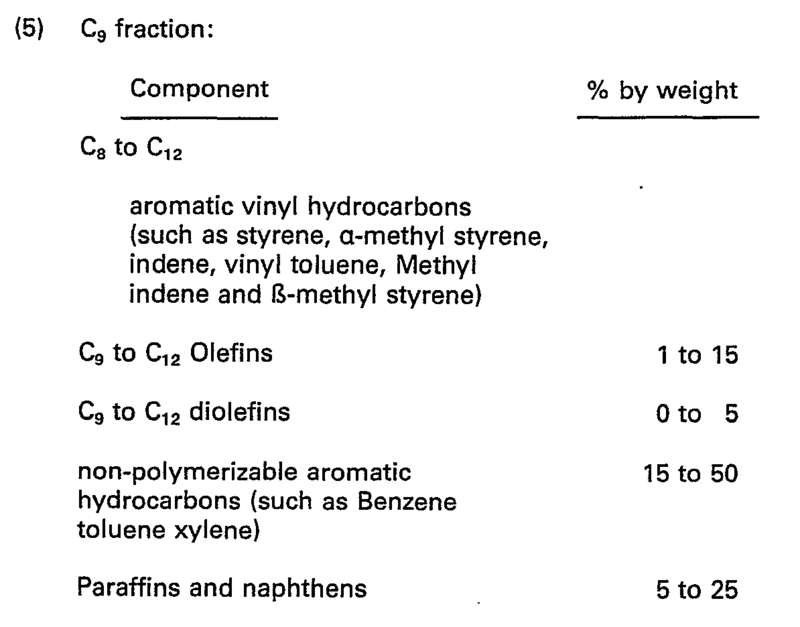 Examples of these hydrocarbon mixtures generally available are various fractions containing unsaturated hydrocarbons obtained as by-products from the refining and cracking (e.g., naphtha cracking) of petroleum, for example, a C4 fraction, a C4 fraction after butadiene removal, a C5 fraction, a C5 fraction after isoprene removal, a Cg fraction, and any mixtures of these fractions; preferred are fractions or the mixtures thereof containing a relatively large amount (e.g., 15% by weight or more) of unsaturated chain hydrocarbons and/or cyclic hydrocarbons having a vinylidene group, or mixtures of these fractions the above-mentioned hydrocarbon contents of which have been adjusted to 30% by weight or more based on the total amount of the polymerizable components. Typical compositions of these fractions are. as follows. These fractions may contain a small amount of other unsaturated compounds as long as the above-mentioned unsaturated hydrocarbons are present as a major component. An increase in the amount of the other unsaturated compounds used tends to decrease the softening point of the resultant hydrocarbon, resin. Accordingly, the amount of the other unsaturated compounds should be limited to such a range that the desired softening point of the hydrocarbon resins are preserved. an isocyanate group or an aldehyde group; R27, R28, R30, R32 and R33 are selected independently from alkyl groups of 1 to 10 carbon atoms and aryl and aralkyl groups having 6 to 10 carbon atoms; R29 and R31 are selected independently from alkylene groups of 1 to 10 carbon atoms; and R34 is hydrogen or an alkyl group having 1 to 10 carbon atoms or an aryl or aralkyl group having 6 to 10 carbon atoms. Examples of these compounds are 9-methyl-9,10-dihydrodicyclopentadiene, 3,9-dimethyl-9,10-dihydrodicyclopentadiene, 9 or 10-hydroxy-9,10-dihydrodicyclopentadiene, 9 or 10-methoxy-9,10-dihydrodicyclopentadiene, 9-acetyl-9,10-dihydrodicyclopentadiene, 9-phenoxy-9,10-dihydrodicyc)opentadiene, 9-isocyanate-9,10-dihydrodicyclopentadiene, and bis(9,10-dihydrodicyclopentadienyl) phosphate. Of these compounds 9,10-dihydrodicyclopentadiene is most desirable. 9,10-Dihydrodicyclopentadiene can be obtained by thermally treating cyclopentadiene contained in a C5 fraction derived from, for example, a naphtha cracking process to form dicyclopentadiene, followed by the hydrogenation of a double-bond of a norbornene ring of dicyclopentadiene. The hydrogenation can be carried out by adding the predetermined molar ratio of hydrogen gas to dicyclopentadiene in the presence of one or more known hydrogenation catalysts at an ambient temperature or an elevated temperature under normal pressures or an elevated pressure by a conventional method. Examples of the hydrogenation catalysts are nickel, palladium, cobalt, platinum, ruthenium, rhodium, copper, the mixtures of these metals and the oxides of these metals. The derivatives of 9,1 0-dihydrodicyclopentadiene can be prepared by thermally dimerizing derivatives of cyclopentadiene, followed by the partial hydrogenation of the dimerized product. Furthermore, the derivatives of 9,10-dihydrodicyclopentadiene can also be prepared by addition reacting alcohols, carboxylic acids, isocyanic acid, phosphoric acid or similar compounds to 9,10-dihydrodicyclopentadiene or its derivatives. Of course, substantially pure 9,10-dihydrodicyclopentadiene and derivatives thereof are desirably used as component (B) in the present invention. 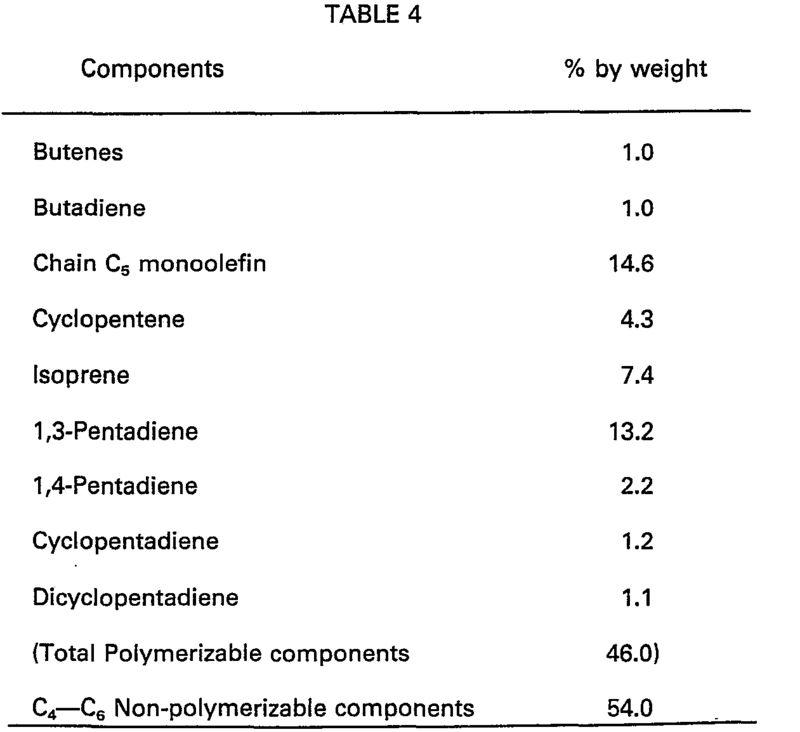 However, component (B) may contain polymerizable components such as cyclopentene, the partially hydrogenated products of cyclopentadiene oligomers (trimer or more), and the partially hydrogenated products of isoprene-cyclopentadiene codimers and non- polymerizable components such as tetrahydrodicyclopentadiene and its derivatives, as long as at least about 60% by weight of 9,10-dihydrodicyciopentadiene or its derivatives are contained. 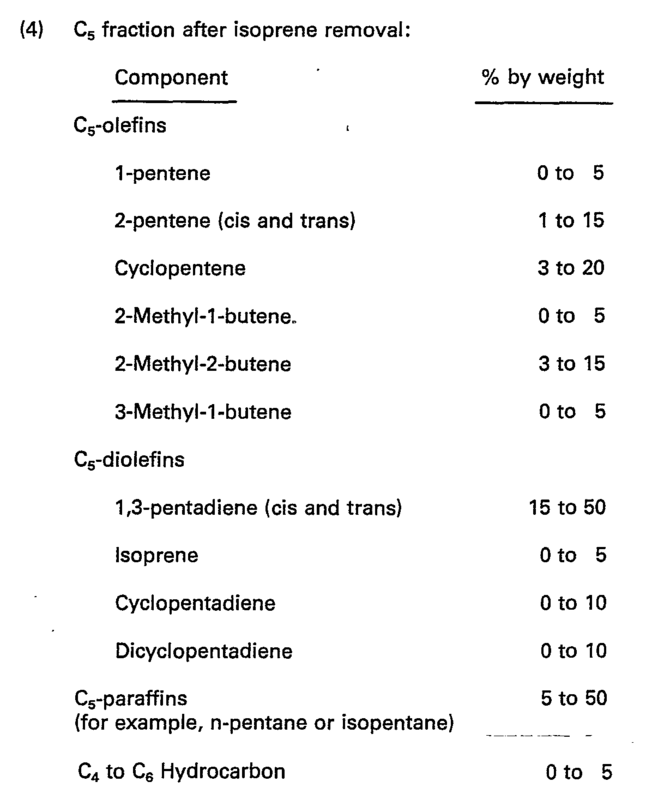 However, contents of, for example, cyclopentadiene, dicyclopentadiene, and cyclopentadiene oligomers (trimer or more) and their derivatives are desirably 10% by weight or less based on the weight of the polymerization components, because the use of these components in too large amounts tend to worsen the color or hue of the resultant hydrocarbon resins and to form gel. Of the above-mentioned unsaturated chain hydrocarbons, diolefins, desirably conjugated diolefins, more desirably 1,3-butadiene, isoprene, 1,3-pentadiene and 2,3-dimethylbutadiene exhibiting small steric hindrance are preferably used as compoent (A) in the present invention because these compounds have a high copolymerizability with 9,10-dihydrodicyclopentadiene or its derivatives. Of the above-mentioned cyclic hydrocarbons containing a vinylidene group, those having the above-mentioned general formula (IV) wherein R19 and R20 are hydrogen, those having the above-mentioned general formula (V) wherein R21 is hydrogen, or those having the above-mentioned general formula (VI) wherein R22 is hydrogen and I is zero can also be preferably used as component (A) in the present invention because of the same reason as mentioned above. Typical examples of such cyclic hydrocarbons are 1,2-dimethylidene cyclohexane, vinylcyclohexane, vinylcyclohexane, vinyltoluene, and tertbutylvinyltoluene. The catalysts used in the formation of the copolymers of the present invention are those conventionally used in the homopolymerization and copolymerization of the above-mentioned various hydrocarbons. Examples of such catalysts are cationic catalysts, anionic catalysts, ionic coordination catalysts and radical catalysts. The cationic catalysts usable in the present invention include those disclosed in, for example, Journal of Japan Petroleum Institute (Sekiyu Gakkai Shi), Vol. 16, No. 10, pp 865 to 867 (1973). Tyical examples of such catalysts are AICI3, AIBr3, BF3, SnC14, SbCl5, FeC13, AIRCI2 (R: an alkyl group having 1 to 6 carbon atoms), Al(C2H5)3―H2O, CCI3COOH and H2SO4. Of these catalysts, Lewis acids, especially AIC13 and AIBr3 are desirably used in the present invention because hydrocarbon resins having good color and a high softening point can be readily obtained at a high yield. Complexes of these Lewis acids with alchols, phenols, esters, ethers, or alkyl halides can also be desirably used as catalysts. The anionic catalysts usable in the present invention include the catalysts for homopolymerization and copolymerization of hydrocarbons, disclosed in, for example, Journal of Japan Petroleum Institute (Sekiyu Gakkai Shi), Vol. 16, No. 9, pp 779 to 784 (1973). Typical examples of such catalysts are K, KR, Na, NaR, Li, LiR, SrZn(R)6, and CuZn(R)4 wherein R is an alkyl group having 1 to 6 carbon atoms. Of these catalysts, Li and LiR are desirably used in the present invention because hydrocarbon resins having good color and a high softening point can be readily obtained at a high yield. These catalysts can be especially desirably used in the present invention when a carbonyl group is contained in the derivatives of 9,10-dihydrodicyclopentadiene. The ionic coordination catalysts usable in the present invention include Ziegler catalysts disclosed in Journal of Japan Petroleum Institute (Sekiyu Gakkai Shi), Vol. 16, No. 8, pp 699 to 704 (1973). Typical examples of such catalysts are combinations of the halides, β-diketone salts or alcoholates of Ti, V, Cr and Zr with AI(R)3, Al(R)nX3-n, LiR, MgRX, or LiH (wherein R is an alkyl group having 1 to 6 carbon atoms, X is a halogen atom and n is (or 2). Of these catalysts, combinations of the halides of Ti or V with an alkylaluminum compound are desirably used in the present invention because the reactivity of 9,10-dihydrodicyclopentadiene and its reactivities is increased. The above-mentioned ionic coordination catalysts are especially desirably used in the present invention when the unsaturated chain hydrocarbons such as monoolefins (e.g., ethylene, propylene, butene-1, pentene-1, hexene-1 and 4-methylpentene-1) and conjugated diolefins (e.g., 1,3-butadiene, isoprene and 1,3-pentadiene) or when the derivatives of 9,10-dihydrodicyclopentadiene do not contain a hydroxyl group or a carbonyl group. The radical catalysts usable in the present invention include those disclosed in Journal of Japan Petroleum Institute (Sekiyu Gakkai Shi), Vol. 16, No. 10, pp 867 to 871 (1973). Typical examples of such catalysts are peroxides such as benzoyl peroxide and tert-butyl hydroperoxide, azo compounds such as azobisisobutyronitrile and redox catalysts such as hydrogen peroxide- a ferrous compound and potassium persulfate-sodium sulfite. These radical catalysts are selected depending upon a polymerization temperature. These radical catalysts are desirably used in the present invention when conjugated diolefins or styrene type compounds are used as component (A) or when the derivatives of 9,10-dihydrodicyclopentadiene contain a polar group such as a hydroxyl group. That is, the polymerization performance of the radical polymerization catalysts does not decrease even when the derivatives of 9,10-dihydrocyclo- pentadiene contain a polar group. The amount of these polymerization catalysts may be widely varied depending upon, for example, the kinds of the catalysts, the kinds and combinations of the comonomers, the polymerization temperatures and the polymerization times. Generally speaking, the amounts of these catalysts are about 0.01 mol% to about 10 mol%, desirably 0.1 mol% to 5 mol%, based on the total amounts of the comonomers. The copolymerization of the present invention can be carried out either in the presence of, or in the absence of, a polymerization solvent. The solvents usable, with all the above-mentioned catalysts, in the present invention include, for example, hydrocarbon solvents such as propane, butane, pentane, hexane, heptane, benzene, toluene, xylene and ethylbenzene. Furthermore, ethers such as diethylether, tetrahydrofuran, dioxane and 1,2-dimethoxyethane can be used for the anionic polymerization catalysts. Chlorinated solvents such as dichloromethane, ethylchloride, 1,2-dichloroethane and chlorobenzene can be used for the cationic polymerization catalysts. Water can be used for the radical polymerization catalysts when an emulsion or suspension polymerization method is used. The copolymerization of the present invention can be carried out in the presence of the above-mentioned catalyst under the conditions of a temperature of minus several tens °C to 150°C, desirably 20°C to 100°C, a normal pressure or an elevated pressure (e.g. 98.1 kPa to 29.52 MPa (0 to 300 kg/cm2G), desirably 98.1 kPa to 5 MPa (0 to 50 kg/cm2G), and a reaction time of 0.5 hours to 10 hours, desirably 1 hour to 8 hours. In the copolymerization of the above-mentioned hydrocarbons (i.e., component (A)) and the 9,10-dihydrodicyclopentadiene or its derivatives (i.e., component (B)), component (B) is desirably used in an amount larger than stoichiometric amount thereof because the reactivity of 9,10-dihydrodicyclopentadiene or its derivatives is generally low. 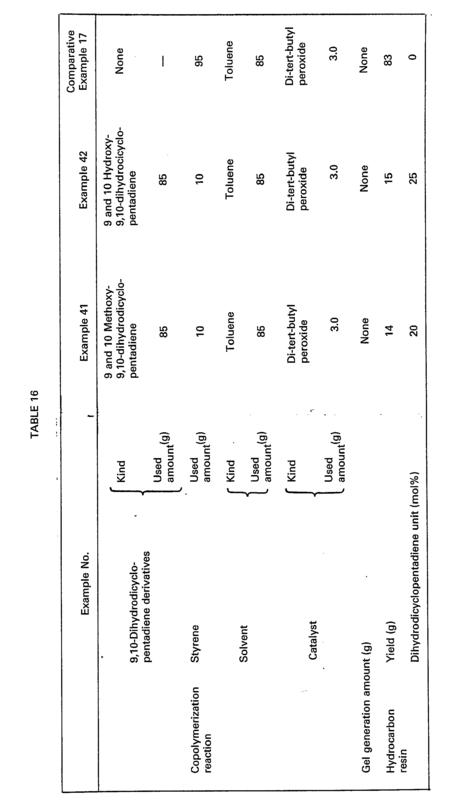 For instance, in order to obtain the copolymers according to the present invention containing 20 mol% to 98 mol% of a polymerization unit of component (A) and 80 mol% to 2 mol% of a polymerization unit of component (B), 10 mol% to 80 mol%, desirably 10 mol% to 60 mol%, of component (A) and 90 mol% to 20 mol%, desirably 90 mol% to 40 mol%, of component (B) are desirably used as starting comonomers in the copolymerization. After the completion of the copolymerization, the remaining catalyst is treated or removed in any conventional manner and the unreacted monomers and the reaction solvent are separated from the desired copolymer by distillation or by adding the copolymerization mixture to a poor solvent for the copolymer. Thus, the desired hydrocarbon resin (i.e., copolymer) can be isolated. The copolymers thus obtained contain 20 mol% to 98 mol%, desirably 30 mol% to 96 mol% and most desirably 40 mol% to 95% of the polymerization unit(s) of component (A) and 80 mol% to 2 mol%, desirably 70 mol% to 4 mol% and most desirably 60 mol% 5 mol%, of the polymerization unit(s) of component (B). The copolymers generally have a softening point, determined by Japanese Industrial Standard (JIS)-K-2531 ring and ball method, of 60°C to 180°C, desirably 80°C to 140°C, a melt viscosity, determined at a resin temperature of 200°C by using an EMILA viscometer, of 5 mPa·s (cps) to 10,000 mPa.s (cps), desirably 10 mPa.s (cps) to 500 mPa.s (cps), a number-average molecular weight, determined by a GPC method (a polystyrene conversion method), of 300 to 15000, desirably 300 to 3000, and most desirably 400 to 1000, a bromine number of 2 to 100 and a Gardner color scale of 1 to 12. A copolymer having a content of component (B) of less than 2 mol% does not exhibit a balanced workability (or processability) and characteristics satisfactory for use as a tackifier, an adhesive and an ingredient for a coating composition. This is because attempt to decrease the melt viscosity of the copolymer causes decrease in the softening point and because attempt to increase the softening point of the copolymer causes increase in the melt viscosity. Contrary to this, a coplymer having a content of component (B) of more than 80 mol% has an undesirably low softening point, high Gardner scale and poor thermal stability. Furthermore, when the amount of component (B) in the coplymer is more than 80 mol%, the degree of polymerization cannot be increased and the polymerization yield is low due to the structure of 9,10 dihydrodicyclopentadiene. In order to increase the degree of polymerization, the use of the catalyst in an extremely high concentration is required, but this causes, in addition to difficulty of commercial production, undesirable decrease in the softening point, undesirable increase in the Gardner color scale and poor thermal stability of the resultant copolymer. The copolymers having the ratio of the polymerization units of components (a) and (B) within the above-mentioned range, especially the above-mentioned desirable range, are those having relatively low melt viscosity as compared with softening point, and also having excellent color and thermal stability. Furthermore, the necessary amount of the catalyst is lowerthan that in the case of the homopolymerization of component (B). On the other hand, the copolymers having the ratio of the polymerization units of components (A) and (B) other than the above-mentioned range have characteristics inferior to those of the copolymers having the ratio of the polymerization units of components (A) and (B) within the above-mentioned range. However, these copolymers still exhibit a relatively low melt viscosity in comparison with the softening point and an improved compatibility with other polymers, as compared with similar polymers not containing the polymerizaton unit of component (B), i.e., 9,10-dihydrodicyclopentadiene and its derivatives. The modified hydrocarbon resins of the present invention can be produced by modifying the above-mentioned copolymers by any conventional methods - for instance modification with an ethylenically unsaturated carboxylic acid or its derivatives as disclosed in, for example, U.S. Patent No. 4086198 and Japanese Examined Patent Publication (Kokoku) No. 57-28429, and modification with hydrogen as disclosed in, for example, U.S. Patent No. 3356660. The ethylenically unsaturated carboxylic acids or their derivatives usable in the modification of the above-mentioned copolymers of the present invention include, for example, α,β-unsaturated carboxylic acids having 3 to 12 carbon atoms and their derivatives such as acrylic acid, methacrylic acid, maleic acid, fumaric acid, itaconic acid, citraconic acid, maleic anhydride, itaconic anhydride and citraconic anhydride, and Diels-Alder addition reaction products of conjugated dienes and an a,(3-unsaturated carboxylic acid or its anhydride such as 3,6-endomethylene-1,2,3,6-tetrahydrophthalic acid or its anhydride. In addition to these compounds, the esters or other derivatives of the ethylenically unsaturated carboxylic acids can also be used in the modification reaction. Of these ethylenically unsaturated carboxylic acids or their derivatives, α,β-unsaturated dicarboxylic acids or their anhydrides, especially maleic acid or maleic anhydride, are desirably used in the modification reaction. These compounds can be used alone or in any mixtures thereof. The modification reaction is generally carried out by addition reacting, for example, 0.01 to 50 parts by weight of an ethylenically unsaturated carboxylic acid or its derivative to 100 parts by weight of the above-mentioned copolymer of the present invention under heating. If the reaction temperature is to be decreased or if the reaction time is to be reduced, a conventional radical initiator may be used. If the unreacted ethylenically unsaturated carboxylic acid remains in a relatively large amount in the reaction mixture, the remaining ethylenically unsaturated carboxylic acid is desirably removed by, for example, concentration. The acid-modified hydrocarbon resins thus obtained generally have an acid value of 0.1 to 150 (desirably 0.2 to 20 and more desirably 0.5 to 15), a softening point of 60°C to 180°C (desirably 80°C to 140°C), a number-average molecular weight of 300 to 15000 (desirably 300 to 3000, and most desirably 400 to 1000), a melt viscosity of 5 to 10000 (desirably 10 to 500), a bromine number of 2 to 100, and a Gardner color scale of 1 to 12. These acid-modified hydrocarbon resins have the advantages, due to the increase in the affinity to pigments, that the flowability and coating film characteristics are improved in the case of being incorporated into coating compositions such as traffic paints and that the adhesive power and the cohesive power are improved in the case of being incorporated into adhesives. The modification of the above-mentioned copolymers with hydrogen is generally carried out in the presence of an appropriate hydrogenation catalyst using a solvent. The hydrogenation catalysts usable in the hydrogen-modification include, for example, metals belonging to groups VI and VIII of the Periodic Table or their compounds, such as nickel, chromium, palladium, platinum, cobalt, osmium, rhenium, ruthenium, a Raney nickel catalyst, nickel sulfide, nickel oxide, copper chromite, cobalt-molybdenum, molybdenum oxide, molybdenum sulfide, platinum oxide, cobalt oxide, rhenium oxide, ruthenium oxide, sponge iron, and iron oxide. The reaction solvents usable in the modification of the above-mentioned copolymers with hydrogen include, for example, various aliphatic, alicyclic and aromatic solvents such as pentane, hexane, heptane, isoheptane, ocatane, isooctane, cyclohexane, methylcyclohexane, decalin, tetralin, benzene, toluene, xylene, and dioxane. The hydrogenation reaction is usually carried out by continuously or batchwise treating the above-mentioned copolymers with hydrogen gas at a temperature of from about 20°C up to the thermal deterioration temperature of the copolymers, desirably 100°C to 300°C, under a reduced pressure to an elevated pressure, usually 98.1 kPa to 29.52 MPa (atmospheric pressure to 300 kg/cm2G), desirably 1.08 to 14.81 MPa (10 to 150 kg/cm2G), for 10 minutes to 24 hours, desirably 10 minutes to 3 hours. These hydrocarbon resins modified with hydrogen have a softening point of 60°C to 180°C, desirably 80°C to 140°C, a number-average molecular weight of 300 to 15000, desirably 300 to 3000, most desirably 400 to 1000, a melt viscosity of 5 to 10000, desirably 10 to 500, a bromine number of 0 to 20 and a Gardner color scale of 5 or less, desirably 1 or less. These modified hydrocarbon resins are particularly suitable for use as tackifiers for natural and various synthetic rubbers. Especially, since the modified hydrocarbon resins are of relatively light color and less odor, these resins are desirably used in the fields where these properties are required. As mentioned hereinabove, the hydrocarbon resins and their modification products exhibit an excellent tack, adhesive power and cohesive power and, therefor, are useful as tackifiers for adhesives and coating compositions such as traffic paints. The adhesives (e.g., pressure-sensitive adhesives and hot melt adhesives) containing as tackifiers the hydrocarbon resins or the modified products thereof according to the present invention will now be explained. The reactive adhesives according to the present invention generally contain 100 parts by weight of a base polymer such as natural rubber, styrene-butadiene rubber, butyl rubber, isoprene rubber, styrene-butadiene-styrene block copolymer, styrene-isoprene-styrene block copolymer, acrylic resin, ethylene - polar monomer copolymer (e.g., ethylene-vinyl acetate copolymer), ethylene-ethyl acrylate copolymer, epoxy resin, or urethane resin and 20 to 200 parts by weight, desirably 50 to 150 parts by weight, of the hydrocarbon resins and/or the modified products thereof, although the compounding ratio may be widely varied depending upon, for example, the intended use of the adhesives. In addition to the base polymer and the tackifier, any of a wax such as polyolefin wax or wax obtained from thermal degradation of a high- molecular weight polyolefin, a plasticizer such as process oil, polybutene, dioctylphthalate (DOP) or dibutylphthalate (DBP), a filler such as calcium carbonate (CaC03) or zinc oxide (ZnO), a pigment such as zinc oxide (ZnO) or titanium dioxide (Ti02), an antioxidant (or antiozonate) such as 2,6-di-tert.-butyl-p-cresol, 2,5-di-tert.-butyl-hydroquinone (DBH) or 2,2'-methylene-bis-(4-methyl-6-tert.-butyl phenol) (W-400), and stabilizer such as trioctyl phosphate or epoxidized soybeanoil, can be optionally compounded into the adhesives. Furthermore, the hydrocarbon resins or the modified products thereof according to the present invention can be used as tackifiers together with conventional hydrocarbon resins. The blending operation can be conducted in a conventional manner such as using a blending roll or in an appropriate solvent. More particularly the pressure-sensitive adhesives or hot melt type adhesives of the present invention can be prepared using the following two approaches. A base polymer is dissolved in a solvent and the resin of this invention along with optional components such as a tackifier resin (hydrocarbon resin), and, optionally, a plasticizer, a filler, an antioxidant, etc. are then added to the above solution followed by mixing at a temperature of room temperature to 50°C for 5 to 25 hours. Suitable examples of solvents which can be used in this process are aromatic hydrocarbons such as benzene, toluene, xylene, etc., aliphatic hydrocarbons such as pentane, hexane, heptane, etc., halogenated aliphatic hydrocarbons such as trichlene, perclene, etc., and the like. A composition containing the resin of this invention and a base polymer, and optionally a plasticizer, a filler, an antioxidant, etc. is mixed at a temperature of 80°C to 200°C for 0.5 to 3 hours using a Banbury mixer, an open roll, etc. In the compounding of the hydrocarbon resins or the modified products thereof according to the present invention with the base polymer and the other optional ingredients, since the hydrocarbon resins or the modified products thereof have a low melt visocity, the amount of solvent used in the solution blend method can be reduced and the energy used in the hot melt blend method can be reduced due to the reduction of the melt blend temperature and the melt blend time. Furthermore, when the hydrocarbon resins or the modified products thereof are compounded as a tackifier into reactive adhesives, the use of reactive or non-reactive type diluents may not be needed (in contrast to conventional adhesives), due to the low viscosity of the hydrocarbon resins or the modified derivatives thereof. The coating compositions containing the hydrocarbon resins or the modified products thereof according to the present invention will now be explained. The hydrocarbon resins or the modified products thereof can be compounded into coating compositions, together with, for example, an alkyd resin, a polyester resin, an epoxy resin, a urethane resin, an acrylic resin, a urea resin, a melamine resin, or a phenolic resin. Thus coating compositions having balanced workability and coated film characteristics can be obtained. Especially, the hydrocarbon resins or the modified products thereof can be advantageously compounded into traffic paints. Preferred traffic paints containing the hydrocarbon resins or the modified products thereof according to the invention can have excellent characteristics such as low-melt viscosity (excellent fluidity), high compression strength, good weatherability, and no substantial sedimentation of filler, as compared with conventional traffic paints. The hot-melt type traffic paints containing the hydrocarbon resins or the modified products thereof further contain a pigment. The pigments usable in the present invention include any white or colored pigments such as, for example, calcium carbonate, titanium dioxide, zinc oxide, and siliceous sand. The pigments can be compounded into the traffic paints in an amount of 25 to 300 parts by weight, desirably 35 to 100 parts by weight, based on 100 parts by weight of the hydrocarbon resins or the modified products thereof. The traffic paints can contain, in addition to the hydrocarbon resins or the modified products thereof according to the present invention, rosin or its derivatives and/or conventional petroleum hydrocarbon resins (e.g., resins having a softening point of 70°C to 120°C and a molecular weight of 500 to 1500 obtained by cationic polymerization of any fractions having a boiling point of -10°C to 280°C derived from cracking or refining petroleum in the presence of a Friedel-Crafts catalyst, aliphatic petroleum resins obtained by polymerizing C4 and/or C5 fractions or a fraction mainly containing 1,3-pentadiene, aromatic petroleum resins obtained by polymerizing a fraction mainly containing a Cg fraction and resins obtained by copolymerizing C4 and/or C5 fractions with a Cg fraction, as a thermoplastic resin. These thermoplastic resins other than the hydrocarbon resins and the modified products thereof according to the present invention can be compounded into traffic paints in an amount of 10 to 200 parts by weight based on 100 parts by weight of the hydrocarbon resins or the modified products thereof. Furthermore, the traffic paints can optionally contain a filler such as calcium carbonate, glass beads and cracked stone in an amount of 50 to 700 parts by weight based on 100 parts by weight of the present hydrocarbon resins and the modified derivatives thereof. Still furthermore, the traffic paints can optionally contain a plasticizer such as animal and vegetable oils, mineral oils and synthetic oils (e.g., liquid paraffin, phthalates and castor oil), a lubricant, and waxes such as a polyolefin wax and thermally degraded waxes. The present invention will now be further illustrated by the following Examples, in which all parts and percentages are expressed on a weight basis unless otherwise specified. Twenty-five grams of a palladium-carbon catalyst (palladium content: 5%) and 2000 g of octain were added to 1710 g of a commercially available dicyclopentadiene (purity: 94.6%), and hydrogen gas was passed through the mixture at a feed rate of 10 ml/min at an ambient temperature under normal pressures for 15 hours. The catalyst was removed from the mixture by filtration, and then the resultant filtrate was distilled to obtain 1500 g of a fraction having a boiling point range of 180°C to 184°C. The gas chromatograph analysis indicted that this fraction contained 84.5% of 9,10-dihydrodicyclopentadiene, 10.0% of tetrahydrodicyclopentadiene, 0.2% of unreacted dicyclopentadiene and 5.3% of unknown components. A C5 fraction obtained from a naphtha cracking was heated at a temperature of 160°C for 5 hours, whereby cyclopentadiene contained therein was converted into dicyclopentadiene. Then, the resultant mixture was distilled to strip a light fraction. Thus, a crude dicyclopentadiene containing 14.0% of a C5 fraction, 2.6% of benzene, 69.1 % of dicyclopentadiene, 7.3% of isoprene-cyclopentadiene codimer, 4.7% of a cyclopentadiene oligomer (i.e., a trimer or more) and 2.3% of unknown components was obtained. 1710 g of the crude dicyclopentadiene obtained above was hydrogenated in the same manner as described in Reference Example A to obtain 1420 g of relatively viscous colorless transparent liquid. The gas chromatograph analysis indicated that the resultant product contained 71.2% of 9,10-dihydrodicyclo- - pentadiene, 10.7% of tetrahydrodicyclopentadiene, 0.5% of unreacted dicyclopentadiene and 17.6% of unknown components. A C5 fraction obtained from a naphtha cracking was heated at a temperature of 150°C for 3 hours, whereby cyclopentadiene contained therein was converted into dicyclopentadiene. Then, the resultant mixture was distilled to strip a light fraction. Thus, a crude dicyclopentadiene containing 4.8% of a C5 fraction, 0.5% of benzene 77.1 % of dicyclopentadiene, 7.2% of isoprene-cyclopentadiene codimer, 8.2% of cyclopentadiene oligomer and 2.2% of unknown components was obtained. 100 parts (1710 g) of the crude dicyclopentadiene and 4 parts of a palladium type hydrogenation catalyst in the form of tablets (C31-1A available from Toyo CCI Co.) were charged into a metallic autoclave and the hydrogenation reaction was carried out at a temperature of 50°C under a hydrogen pressure of 0.98 MPa (10 kg/cm2) for 12 hours while stirring. The catalyst was removed by filtration and the filtrate was distilled to obtain 90 parts of 9,10-dihydrodicyclopentadiene component. The gas chromatograph analysis indicated that this fraction contained 19.0% of pentanes, 77.0% of 9,10-dihydrodicyctopentadiene, 0.1 % or less of dicyclopentadiene, 0.8% of tetrahydrodicyclopentadiene and 3.2% of unknown components. 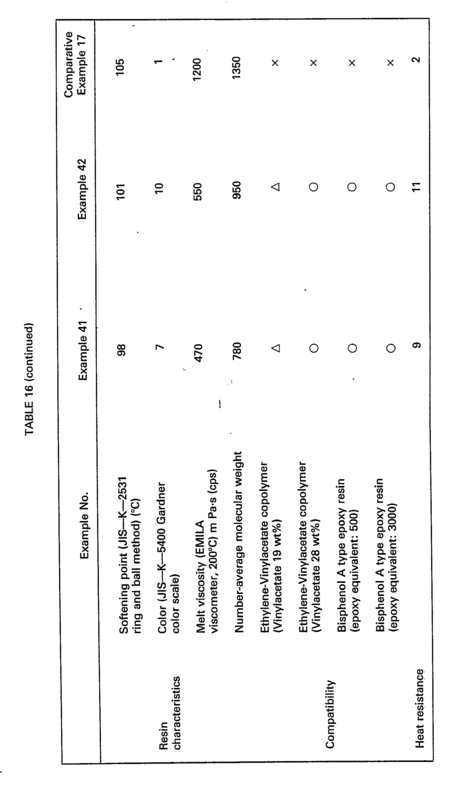 In each case the catalyst and a portion (20 ml) of the solvent listed in Table 1 were charged into a 1 liter glass autoclave. The 9,10-dihydrodicyclopentadiene containing fraction obtained in Reference Example A or B, diolefin and the remaining solvent were gradually added as a mixture by means of a pressure resistant cylinder to the contents of the autoclave while stirring. During the addition, the contents of the autoclave were maintained at a temperature of 60°C by heating or by cooling. The addition of the comonomers was carried out for about 15 minutes. The polymerization was allowed to continue at this temperature for about 2 hours and, then, the catalysts were decomposed by the addition of methanol, and the resultant mixtures were washed with water. The polymerized oily products were filtered with a glass filter and determined the generation of gels. Thereafter, the filtrates were concentrated to form hydrocarbon resins. 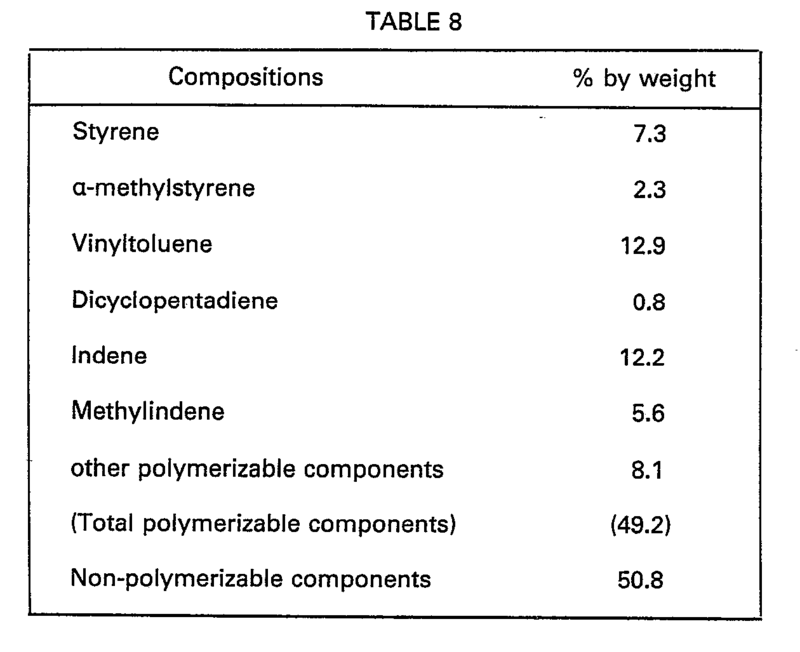 The properties and characteristics of the resultant hydrocarbon resins are shown in Table 1 below. A) Ethylene-vinylacetate copolymer, Evaflex 410 (vinylacetate content: 19 wt%) or Evaflex 210 (vinylacetate content: 28 wt%), manufactured by Mitsui Polychemical Co., Ltd. was mixed with the hydrocarbon resin in equal amounts on a hot plate having a temperature of 180°C, and the resultant mixture was coated on a polyester film so as to form a coating having a thickness of about 1 mm. The transparency of the coating thus obtained was visually evaluated. A') The compatibility of Bisphenol A type epoxy resin, Epomik R-304 (epoxy equivalent: about 500) or Epomik R-309 (epoxy equivalent: about 3000), manufactured by Mitsui Petrochemical Epoxy Co., Ltd. with the hydrocarbonresin was evaluated in the same manner as in the above-mentioned A). The words "Evaflex" and "Epomik" are trade marks. B) The hydrocarbon resin was dissolved in a 10% toluene solution of natural rubber in the same amount as natural rubber in the solution, and the solution thus obtained was coated on a polyester film so as to form a coating having a thickness of about 80 um. The transparency of the coating thus obtained was visually evaluated. C) Commercially available modified rosin for a traffic paint (maleate type: softening point 94°C, acid value 24 and melt viscosity 150 mPa.s (cps)) and the hydrocarbon resin were charged into a test tube in equal amounts and dissolved and mixed in oil bath having a temperature of 180°C. The transparency of the mixture after cooling to a room temperature was visually evaluated. 2.5 g of the hydrocarbon resin was placed in a test tube having an inner diameter of 15 mm and a length of 18 mm and was heated on an oil bath having a temperature of 200°C for 3 hours. The color was determined according to the Gardner method (JIS-K-5400). 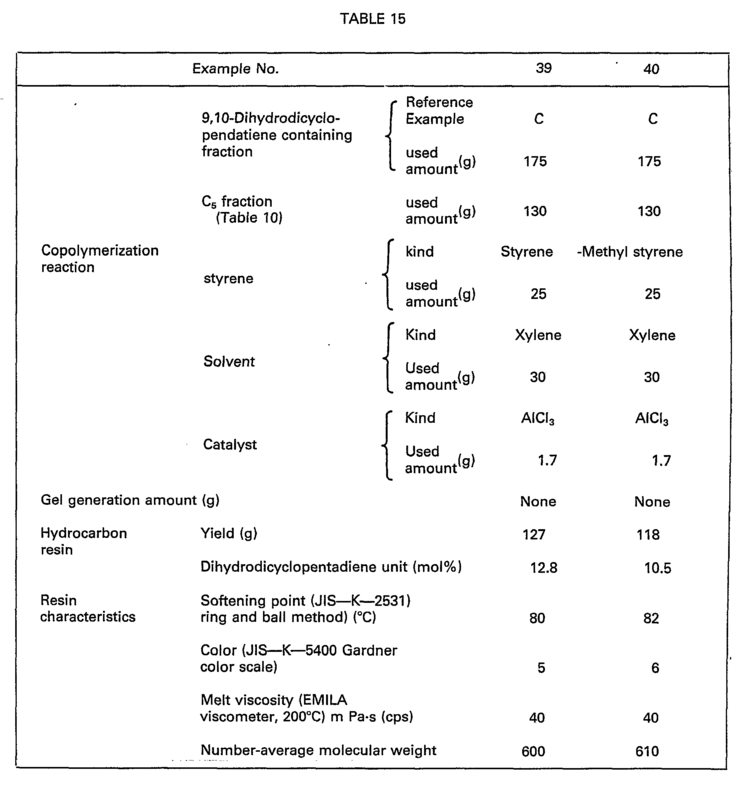 The compositions of the starting mixture prior to the copolymerization and the oily polymerization product after the copolymerization were determined by a gas chromatograph analysis. The content of 9,10-dihydrodicyclopentadiene was calculated from the reaction amounts of the comonomers. Homopolymerization of 9,10-dihydrodicyclopentadene containing fraction and isoprene, and copolymerization of 9,10-dihydrodicyclopentadiene containing fraction and dicyclopentadiene were carried out in the same manner as in Examples 1 to 11. 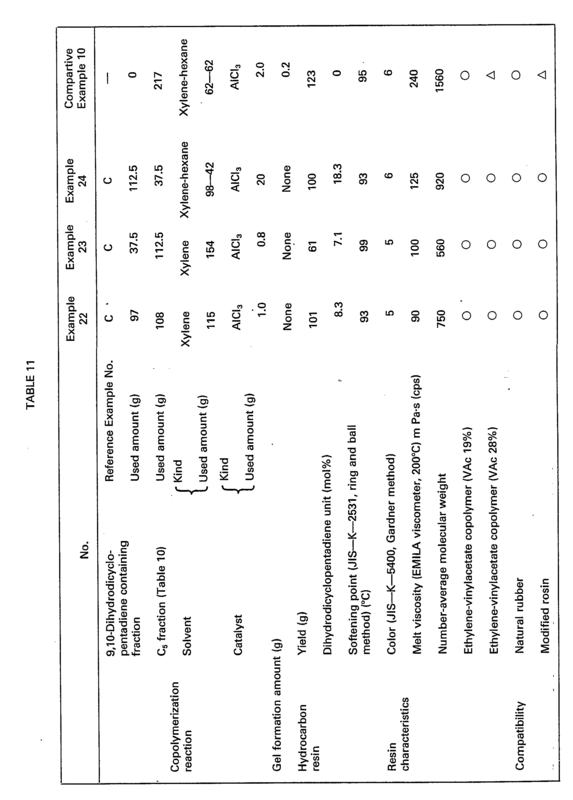 The properties and characteristics of the resultant hydrocarbon resins are shown in Table 2. 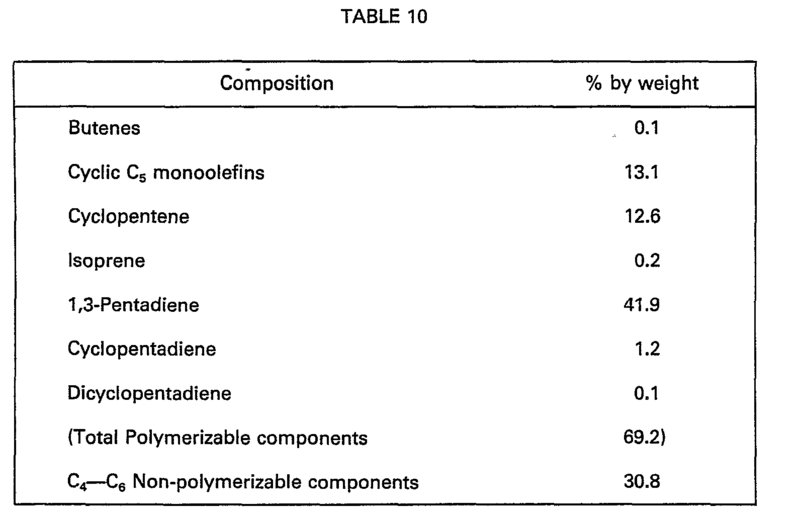 As should be clear from the results shown in Table 2, the polymerizability of 9,10-dihydrocyclo- pentadiene alone is very low and the resultant hydrocarbon resin has low softening point, poor color and heat resistance. Furhtermore, the copolymer thereof with dicyclopentadiene has extremely poor color and heat resistance. Example 1 was modified in that 9,10-dihydrodicyclopentadiene containing fraction mixed with remaining solvent was added, while stirring, for 5 minutes to a 1 liter glass autoclave containing the predetermined amount of the catalyst and a portion (20 ml) of the solvent, and then, the 1,3-pentadiene was gradually added thereto for 1.5 hours while the temperature was maintained at 60°C. The copolymerization mixture was allowed to react for further 25 minutes at a temperature of 60°C. The results are shown in Table 3 below. As should be clear from the above results, the yield of the resultant hydrocarbon resins was larger than that of Example 1. Furthermore, the content of 9,10-dihydrodicyclopentadiene polymerization unit in the hydrocarbon resin is increased and the melt viscosity of the hydrocarbon resin is decreased, as compared with the case of Example 1. A Cs fraction having the composition listed in Table 4 below was copolymerized with the 9,10-dihydrodicyclopentadiene containing fraction obtained in Reference Example A. 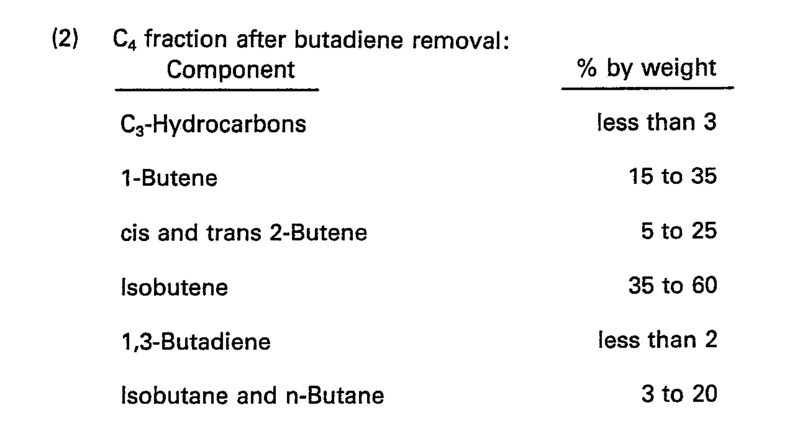 The results of the resultant hydrocarbon resins are shown in Table 5. 0.5 parts of maleic anhydride was added to 100 parts of the hydrocarbon resins obtained in Example 3, and the mixture was then reacted at a temperature of 200°C for 2 hours. Thus, maleated hydrocarbon resin having a softening point of 99°C, a Gardner color scale of 7 and an acid value of 2.0 was obtained. To 100 parts of the maleated hydrocarbon resin, 12 parts of a plasticizer (Tokushinol TS-110 available from Tokushima Seiyu Co.), 200 parts of coarse calcium carbonate grain (Kansui #30 available from Nitto Funka Co.), 200 parts of fine calcium carbonate powder (Whiten H available from Shiraishi Calcium Co.), 66 parts of titanium dioxide (Tipaque A-220 available from Ishihara Sangyo Co.) and 100 parts of glass beads (GB-153T available from Toshiba Ballatini Co.) were added, and the mixture was melt blended on an oil bath at a temperature of 200°C. Thus, a traffic paint composition was prepared. 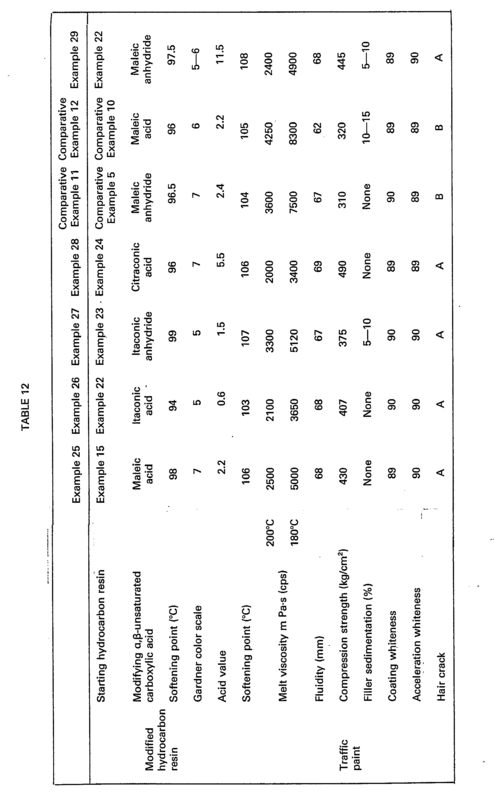 The properties and characteristics of the traffic paint composition thus obtained are shown in Table 6 below. As comparative examples, the physical properties and characteristics of a commercially available petroleum type traffic paint (Comparative Example 6) and modified rosin type traffic paint (Comparative Example 7) are also shown in Table 6. 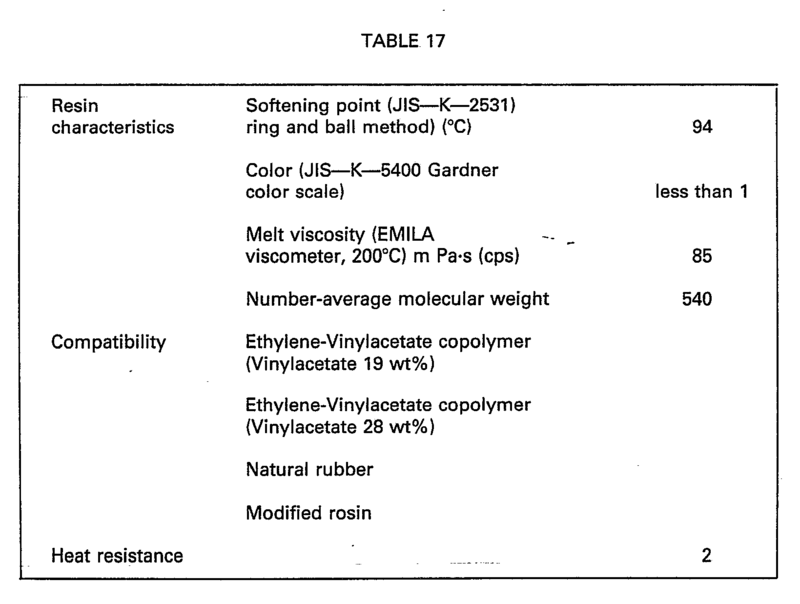 As should be clear from the results shown in Table 7, the traffic paint compositions containing the maleated hydrocarbon resins according to the present invention have low viscosity, and therefore excellent workability, and also have a high compression strength, no sedimentation property of the filler and good weatherability. The excellent performance of this traffic paint composition cannot be seen in conventional traffic paints. The words "Tokushinol", "Kansui", "Whiten H" and "Tipaque" are trade marks. 2. Melt viscosity: Determined by using a molten composition at 200°C by means of EMILA type rotational viscometer at a shear rate of 176/sec. 3. Fluidity: A molten composition at 200°C was stirred and a portion thereof was rapidly taken with a metallic ladle having a diameter of 31 mm and a depth of 24 mm was flown down on a flat aluminum plate from a 30 mm height. The long and short diameter of the cured coating film in the form of circular- or round-like shape were measured and the average diameter was defined as fluidity (mm). 5. Filler sedimentation (%): Unmelted composition was filled into a 50 ml beaker and was allowed to stand at a temperature of 240°C for 2 hours. Thereafter, the composition was cooled and was cured. The sedimentation percent of the filler in the vertical cut surface of the cured product. 6. Whiteness of coating film: a test specimen was prepared according to a JIS-K-5665-5 and -6 method and the values L, a and b thereof were determiend by means of a color studio. From these values, the whiteness W was calculated from the following equation. The test specimen used in the determination of the whiteness of coating film was subjected to an accelerated deterioration for 100 hours by means of a sunshine weatherometer. Thereafter, whiteness was determined in the same manner as mentioned above and the value obtained was defined as whiteness after accelerated deterioration. A: No change was observed. B: Slight hair crack was observed. C: Hair crack had grown and was clearly observed. D: Hair crack had grown and reached to the panel. Adhesive compositions were prepared by using the hydrocarbon resin obtained in Example 3 (i.e., Example 18), the maleated hydrocarbon resin obtained in Example 17 (i.e., Example 19) and commercially available resin (Wing tack plus available from Goodyear Co.). The physical properties and characteristics of the adhesives thus prepared were evaluated. "Wing tack plus" is a trade mark. The results are shown in Table 7. As should be clear from the results shown in Table 7, both the hydrocarbon resin and the maleated hydrocarbon resin according to the present invention have excellent tack and adhesive power superior to those of the commercially available resin. (Wing tack plus available from Goodyear Co.). The physical properties and characteristics of the adhesives thus prepared were evaluated. The results are shown in Table 7. As should be clear from the results shown in Table 7, both the hydrocarbon resin and the maleated hydrocarbon resin according to the present invention have excellent tack and adhesive power superior to those of the commercially available resin. An adhesive composition was prepared by blending 100 parts of a starting hydrocarbon resin obtained in Example 18 or 19, or Comparative Example 8, with 100 parts of a commercially available SIS type block copolymer, Califlex TR-1107 (Shell Chemie), 30 parts of a mineral oil, Shellflex 371 N (Shell Oil Co.) and 3 parts of a stabilizer, Irganox 1010 (Chiba Geigy) and the mixture was kneaded at a temperature of 150°C for 30 minutes by using a kneader. The adhesive composition thus obtained was coated onto a polyester film (Lumorror available from Toray Industries Inc., thickness 25 pm) by means of a hot-melt type applicator so as to form a coating film having a thickness of 55 Ilm. With regard to the sample thus obtained, tack was determined at 20°C according to the J. Dow Rolling Ball method (see USP 3963653, column 11 lines 9 to 28) and both adhesive force and cohesive force were determined according to JIS-Z-1522. "Califlex", "Shellflex", "Irganox" and "Lumorror" are trade marks. 142 g of 9,10-dihydrodicyclopentadiene containing fraction obtained in Reference Example B was charged into a 1 liter four-necked flask provided with a stirrer, a thermometer, a cooler, a dropping funnel and a catalyst feed nozzle with a rubber stopper. Then, 2.5 g of a boron trifluoride-phenol complex was added to the flask while stirring under a nitrogen atmosphere. The mixture was gradually heated to a temperature of 40°C. Then, 205 g of naphtha cracking oil having a boiling temperature range of 140°C to 230°C and having the composition listed in Table 8 below was dropwise added to the flask for 2 hours. After the addition, the mixture was allowed to react for 30 minutes, while the reaction temperature was maintained at a temperature of 40°C to 45°C. Then the catalyst was decomposed with aqueous sodium hydroxide and was washed with water. The resultant mixture was concentrated to obtain 126 g of a hydrocarbon resin. Copolymerization was carried out in the same manner as in Example 20, except that 101 g of 9,10-dihydrodicyclopentadienyl phenyl ether (prepared from dicyclopentadiene and phenol according to a method disclosed in Bulletin of the Chemical Society of Japan, Vol. 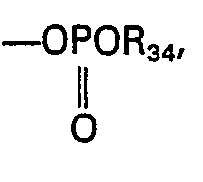 50, pp 2203, 1973) was used, in lieu of 9,10-dihydrodicyclopentadiene containing fraction. Thus, 120 g of a hydrocarbon resin was obtained. 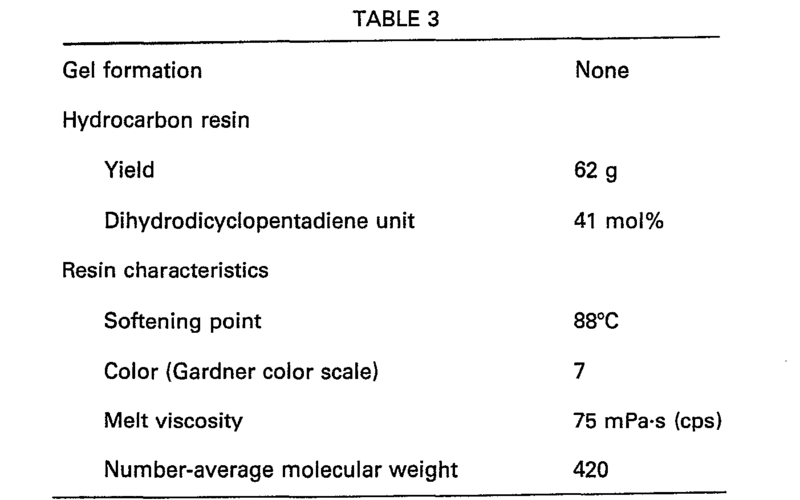 The characteristics of the resultant resin are shown in Table 9 below. 2.2 g of boron trifluoride-phenol complex was dropwise added to 290 g of the naphtha cracking oil used in Examples 20 and 21. The mixture was reacted at a temperature of 40°C to 45°C for 2.5 hours. Thus, 135 g of a hydrocarbon resin was obtained. 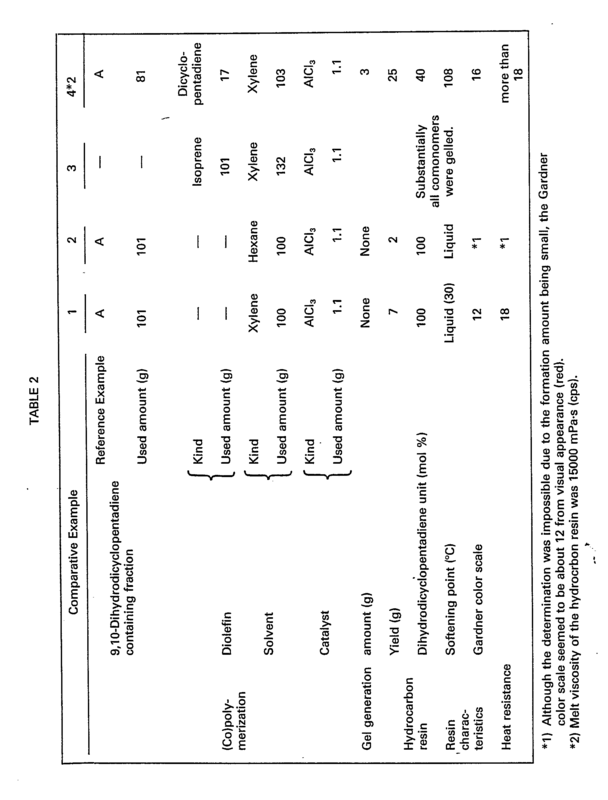 The characteristics of the resultant resin are shown in Table 9. 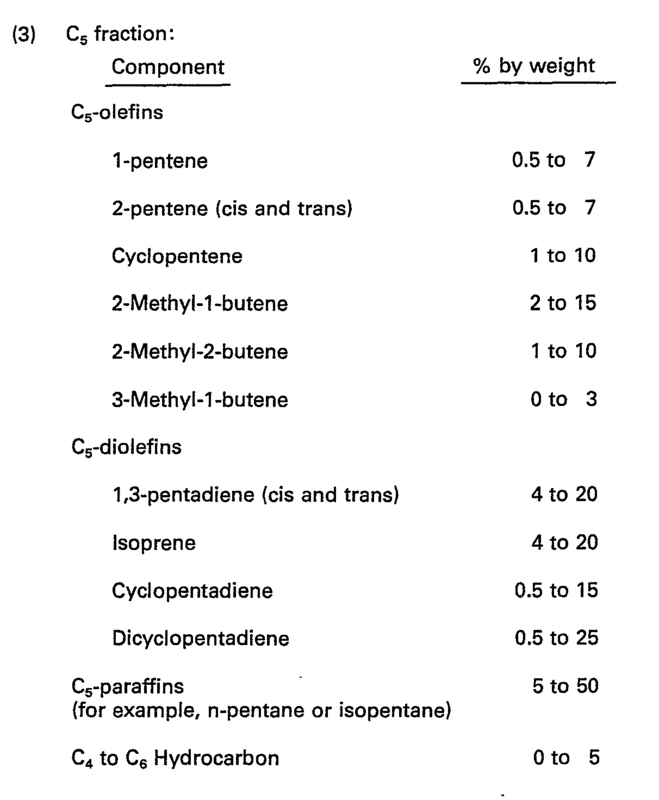 The 9,10-dihydrodicyclopentadiene containing fraction obtained in Reference Example C was copolymerized with a C5 fraction having the composition listed in Table 10 (1,3-pentadiene-rich fraction obtained after removing isoprene, pentane and cyclopentadiene from a naptha cracking C5 fraction). The results are shown in Table 11 below. 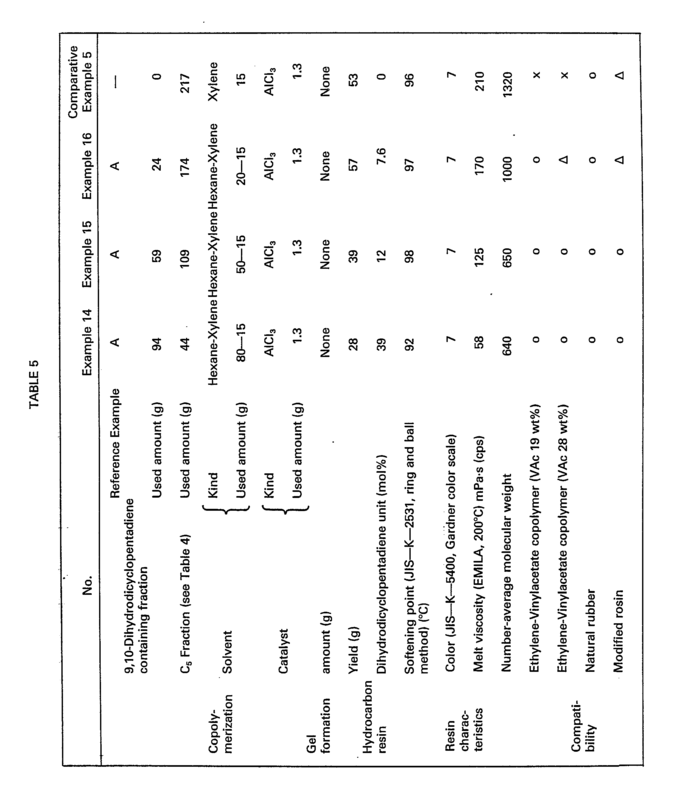 The hydrocarbon resins obtained in Example 15 and 22 to 24 and Comparative Examples 5 and 10 were modified with α,β-unsaturated carboxylic acids or the anhydrides thereof in the same manner as decribed in Example 17 to form the corresponding modified products of the hydrocarbon resins. Traffic paint compositions were prepared from the modified hydrocarbon resins obtained above. The characteristics of the traffic paint compositions are shown in Table 12 below. 2.5 parts of maleic anhydride and 1 part of di-tert-butylperoxide were added to 100 parts of the hydrocarbon resin obtained in Example 22. The mixture was stirred in a molten state at a temperature of 180°C for 5 hours, and then, low boiling point products were removed under a reduced pressure. Thus, 102 parts of maleated hydrocarbon resin was obtained. A traffic paint composition was prepared in the same manner as described in Example 17. The characteristics of the traffic paint composition are shown in Table 12. Adhesive compositions were prepared by using the hydrocarbon resins obtained in Examples 15 and 22 to 24 and Comparative Examples 5 and 10 in the same manner as described in Example 18. 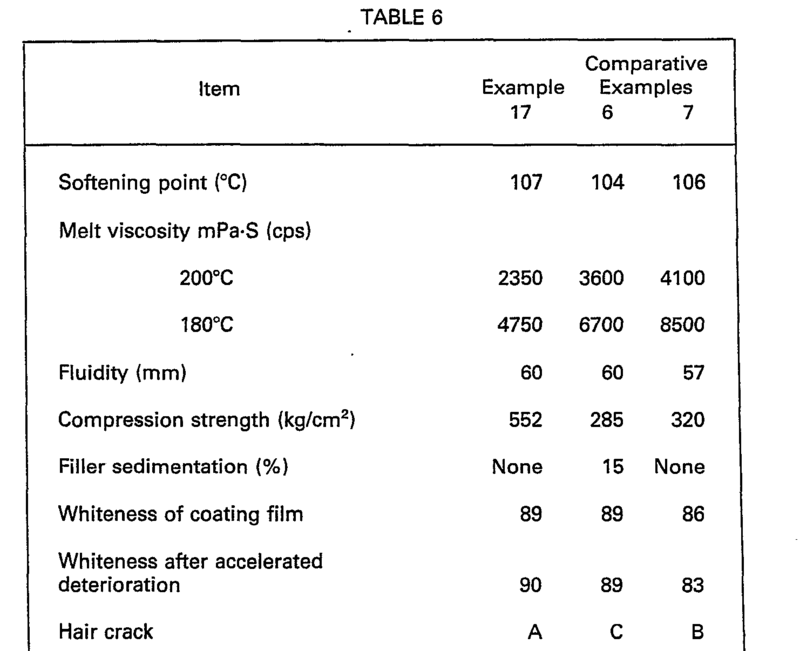 The characteristics of the adhesive tapes prepared from the resultant compositions are shown in Table 13 below. Adhesive compositions were prepared by using as tackifiers the modified hydrocarbon resins obtained in Examples 25 to 29 and Comparative Examples 11 and 12. 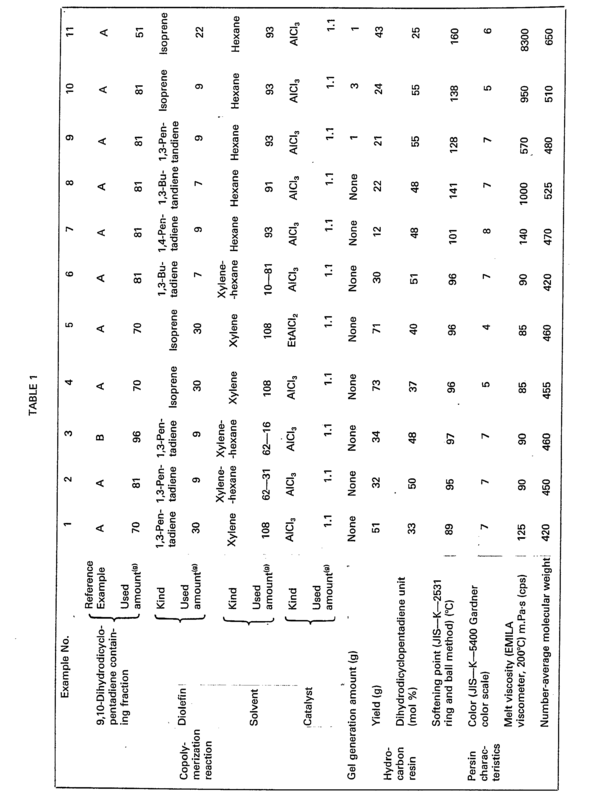 The characteristics of the adhesive tapes prepared from the resultant compositions are shown in Table 14 below. The 9,10-dihydrodicyclopentadiene containing fraction obtained in Reference Example C was copolymerized with the C5 fraction having the composition listed in Table 10 and styrene (or a-methyl styrene) in the same manner as described in Examples 1 to 11. The results are shown in Table 15 below. 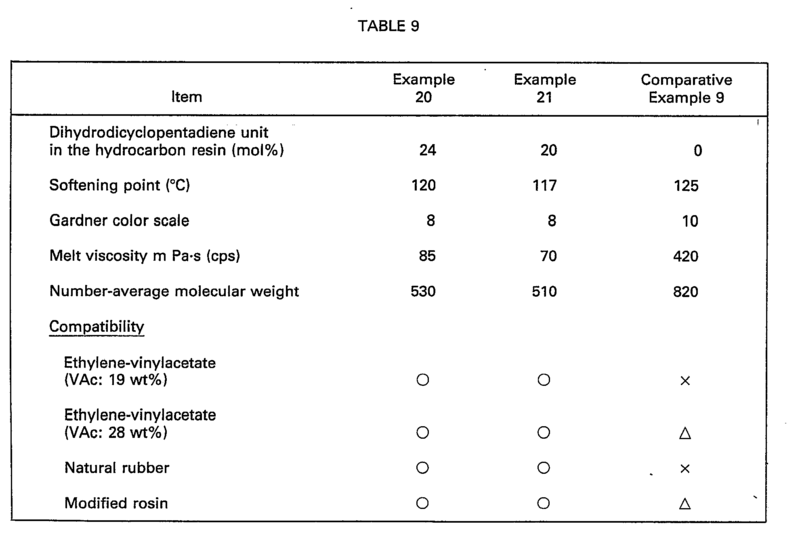 The monomers and solvent listed in Table 16 below were charged to a one liter four-necked flask provided with a thermometer, a stirrer, a condenser and a dropping funnel and the content of the flask replaced with nitrogen. Three grams of di-tert-butyl peroxide was added to the flask through the dropping funnel while the solvent was refluxed upon heating. The reflux was then continued for 20 hours. Thereafter, the polymerization mixture was concentrated at a temperature of 210°C under a pressure of 1.33 kPa (10 mmHg) to obtain a hydrocarbon resin. The results are shown in Table 16. An infrared spectrography indicated that the hydrocarbon resin of Example 42 had an absorption of 3300 to 3600 cm-1 due to the presence of a hydroxy group. Thirty grams of the hydrocarbon resin obtained in Example 23, 90 g of hexane and 0.6 g of a Ni-catalyst (N-113 manufactured by Nikki Chemical Co.) were charged into a 300 ml steel autoclave and, then, a hydrogen gas was pressurized into the autoclave up to 9.81 MPa (100 kg/cm2). The mixture was heated to a temperature of 230°C for 4 hours while agitating. After cooling, the autoclave was depressurized and the catalyst was removed from the polymerization mixture by filtration. The filtrate was then concentrated to obtain 27 g of a hydrocarbon resin. 1. A hydrocarbon resin comprising a copolymer essentially of (A) at least one unsaturated hydrocarbon selected from (i) unsaturated chain hydrocarbons and (ii) cyclic hydrocarbons having at least one vinylidene group and (B) at least one compound selected from 9,10-dihydrodicyclopentadiene and its derivatives, the copolymer containing 20 mol % to 98 mol % of component (A) and 80 mol % to 2 mol % of component (B). 2. A resin according to claim 1 characterised by a softening point of 60°C to 180°C, a melt viscosity of 5 m Pa·s (cps) to 10000 m Pa·s (cps), and a number-average molecular weight of 300 to 15000.
wherein R19 to R22 are independently hydrogen or a methyl group, m is 0 or an integer of 1 to 3, R23 is hydrogen or an alkyl group having 1 to 6 carbon atoms and the R23's may be the same or different in the case of m = 2 or 3, R24 is a saturated or unsaturated hydrocarbon chain having 1 to 6 carbon atoms, I is 0 or 1, X is a saturated or unsaturated hydrocarbon chain having 2 to 6 carbon atoms and Y is a saturated or unsaturated hydrocarbon chain having 3 to 7 carbon atoms, and the hydrocarbon chains represented by X and Y may be substituted with an alkyl group having 1 to 4 carbon atoms or a halogen atom. 4. A resin according to any preceding claim characterised in that component (A) comprises at least one compound selected from chain diolefins having 4 to 6 carbon atoms, aromatic alkenyl compounds having 8 to 10 carbon atoms, and 1,2-dimethylidene compounds having 8 to 10 carbon atoms. 5. A resin according to any preceding claim characterised in that component (B) comprises at least one of 9,10-dihydrodicyclopentadiene, and 10-methoxy-9,10-dihydrodicyclopentadiene, and 9- and 10-hydroxy-9,10-dihydrodicyclopentadiene. 6. A modified resin obtained by addition reacting a copolymer as defined in any preceding claim with a co-reactant selected from hydrogen and ethylenically unsaturated carboxylic acids and derivatives thereof. 7. A modified resin according to claim 6, characterised in that the co-reactant comprises α,β-unsaturated carboxylic acid or derivative, preferably maleic acid or anhydride. 8. An adhesive or traffic paint characterised in that it comprises a modified or unmodified resin according to any preceding claim. 9. A process for producing a hydrocarbon resin according to claim 1 comprising copolymerizing 10 mol % to 80 mol % of (A) at least one unsaturated hydrocarbon selected from (i) unsaturated chain hydrocarbons and (ii) cyclic hydrocarbons having at least one vinylidene group and 90 mol % to 20 mol % of (B) at least one compound selected from 9,10-dihydrodicyclopentadiene and its derivatives in the presence of a copolymerization catalyst therefor.